36 pieces~The Big Valentine has something for everyone! From Red Velvet to Chocolate Ship, White Chocolate to Milk Chocolate and Semi-Sweet! Great for Valentine's Day Parties at home or office! The Big Valentine says it all! 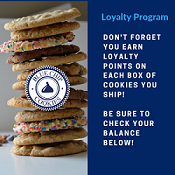 The Big Teddy Bears gets in the way after 2 days and flowers fade and die, but this is a Big Tin full of Blue Chip Cookies and Brownies will be a lasting reminder for your loved one, family, friends and customers. We made it easy and created the assortment for you! Cherries and Cream: Cherries with white chocolate, like a fine wine! Chocolate Chip M&M: A colorful chocolate chip cookie combined with the famous Mars candy. 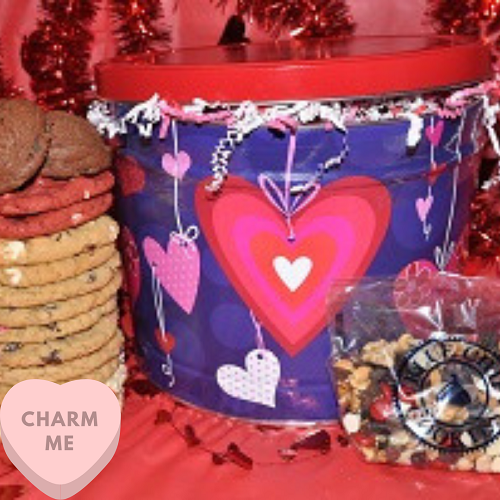 Each cookie is baked with Valentine M&Ms. Oatmeal Chocolate Chip: Just old fashion as they get with delicious semi-sweet chips. Peanut Butter: Just old fashion creamy peanut butter cookie, with Mom's fork marks too! Red Velvet: Cookie and cake combine for a RED explosion of color and flavor! Velvety! Sugar with Seasonal Sprinkles: Favorite amongst our younger fans and those who are young at heart, our sugar cookies are coated with seasonal sprinkles, red and pink, for that valentine cookie. Sugar Iced with Valentine Decoration: Iced sugar cookie with fun and sweet decorations. Brownies-Our newest product, flashback from San Francisco days. Our recipe, now available online.